Can you believe it? It is almost time to start a new year. I know that I am one to make resolutions each year, many of which I do an okay job of maintaining. Take last year for example, I decided that I wanted to make exercise more of a focus again. I have always been active at various levels, but last year I wanted to refocus. I think the reason that I was able to stick with it is that I found a great group of women to work out with. We are fortunate enough to have been able to talk our instructor into additional classes and now have class together 4 days a week (was 5, but she took a break last session and someone else took over her class this coming session). It is a great motivator. I look forward to seeing everyone, the classes are different each day. I may not have lost the weight that I wanted (evidently, as my instructor says, my jaw is still my strongest muscle), but I am certain that I am in better shape than I have been for a long time. - it alleviates stress, there is just something comforting about knowing what we will eat. Even though we do step away from the plan from time to time, it is there and I always have an answer to 'what's for dinner?'. It also means that we are more likely to have the ingredients on hand that we need - I say more likely, because some of the recipes are amongst our favorites, I don't always go through the effort of reviewing the recipe to make sure that I do have everything. - it helps me shop wisely, waste less and save money. I don't necessarily plan my weekly menu based on what's on sale, but it does influence me. But, also, because I do plan, I don't have to worry that the tilapia or the pork chops that I bought multiple of on a deal will get forgotten. - it helps me eat better. When I am planning, I will balance the menu with lighter choices to make sure that we are getting a good mix of meals. Plus, if I plan a specific meal and buy a vegetable(s) to go with it, I am more inclined to make the vegetable(s) than if I am trying to put something together at the last minute. I don't normally call out side dishes, but frequently we have a salad with dinner, some vegetables on the side, sometimes we have bread, etc. - it allows us to eat dinner together most days. Even during our busy seasons, by planning the menu I can make sure that we have quick to table meals and/or can prep stuff the day before to allow the meal to be quick to table. - it works for my kids. They like to look ahead at their school lunch menu and their dinner menu. It also helps if I am making a less than favorite meal earlier in the week, but they know that one of their favorites is coming up in a few days. This week we are still on holiday (I have to go back Thursday), so breakfast is cereals and lunch is either leftovers, sandwiches or whatever mood strikes us. No compensation was received for this post. All opinions expressed are my own or that of my family. As a Hormel Foods Extended Family Blogger, I received information from Hormel for this post, as well as product samples. I'm not sure how it works at your house, but at my house, we can usually get one or two leftover meals in enjoying the food as originally prepared before it gets to be ho hum or plain old undesirable. As such, over the years, I have come up with several ways to enjoy our leftovers as new meals and the family is less likely to get tired of them. Plus, if I have a good amount, I will sometimes freeze them for those other meals. Pulled Barbecue Turkey Sandwiches - make your own sauce or use a bottle of barbecue sauce. Let it all sit in the crock pot for a few hours and it will be tender and yummy. Loaded Turkey Nachos - Layer tortilla chips with shredded turkey, shredded cheese, diced tomatoes and all of your favorite toppings. Put in the oven for about 15 minutes, so that everything warms through and the cheese melts. Serve with sour cream, salsa and/or guacamole. Turkey Shepard's Pie - substitute cubed or shredded turkey for the ground meat and use up your turkey gravy, vegetables and mashed potato leftovers too. * Looking for a new approach for all that leftover Thanksgiving turkey? Create Greek Turkey Kabobs by cutting Jennie-O® Turkey Store® oven roasted turkey breast into cubes and alternately threading them onto skewers with cucumbers, tomatoes and Peloponnese® kalamata pitted olives. This Mediterranean twist might just convert reluctant turkey eaters! * Use extra holiday ham and pie crusts to bake a delicious quiche! Mix in your favorite vegetables and seasonings with Hormel® Cure 81® sliced ham to create a wonderful meal that can feed the whole family. * If you’re craving the standard leftover turkey sandwich, take it up a notch with corn tortillas! They make a great stand-in for bread and give your sandwich an extra special crunch. * Make a lunchtime salad by tossing pasta with leftover turkey or ham, vegetables, and your favorite dressing. May you and your family have a wonderful, Merry Christmas. On Sunday, I decided that the 25% off coupon that I had received by e-mail for CVS was likely to be my best opportunity for picking up additional Slim-Fast (protein shakes in my world) at the best value. My coupons expire first part of next week and although I expect a New Year's resolution type sale, I expect it will be the first week of next year, vs the week of New Year's. The deal turned out even better than I expected. When I got home and looked at my receipt, I understood part of why it was better than I expected. Before checking out, I asked if I could use two of the same CVS coupons in one transaction, as I wanted to take advantage of my 25% off offer and was told that would not be a problem. Paid with $10 ECB and $1.02 OOP ($.45 plus $.57 tax). Turns out that the SlimFast has a buy 3 or more and save price of $6, but the computer still treated it as the regular price of $7.49, so with just my CVS and manufacturer's coupon, I paid $.38 for each 4-pk...but, remember that I got 25% off as well on some portion of them. The 25% off was based on a subtotal of $24.72, which as per normal I can't quite figure out what items it applied to. Unfortunately, I think the BOGO coupon is no longer available, as I looked for it on a friend's computer and didn't find it. Too bad, that is quite a deal. Did you print it while it was available? In the end, my receipt says that I saved $53.13 or 99%. Not too shabby. Can you believe it? Just a few days until Christmas. Things are still pretty busy, but starting to slow down here. I love having several days in a row off of work with no real plans. We will likely go to the swimming pool (did that today actually), perhaps go roller skating, fit in a little shopping, visiting with family and visiting with friends, and probably a good number of movies (and if I'm lucky, some reading too). I find that with undefined days, it is still good to have some level of menu plan in place...but, I'm a realist and willing to assume that it will flex at least some depending on what we do each day. This week, we are all home so we will wing it for lunch - likely enjoying leftovers, peanut butter and jelly, pizza sticks, soup or other things we have around home. What is on your holiday menu? No compensation was received for this post. All opinions expressed are my own or that of my family. I was offered the opportunity to take a tour of the club and received a gift card from BJs. It is so hard to believe that we are just days away from Christmas and that New Year's Eve is next week. Are you ready? Whether you are planning and hosting a gathering for family and/or friends, or looking for that last minute gift or a hostess gift to take with you, you can find several options to fit your needs at BJs. From Buffet Servers, to cocktail mixers, to Lindt Lindor Milk Chocolate or Peppermint Truffles, to Gift Sets, they have a variety of options that can help make your holiday prep less stressful. Looking for more holiday decor? They have that to - from LED Christmas Tree to a Wreath and Garland Set to a 12 Ft. Snowman Lightshow. They also carry wrapping paper and gift tags. We have been members at BJs since the kids were born. It was hard to dismiss their value advantage, not only can you buy in bulk typically for a better value than you can find at the grocery as with most club/warehouse stores, but you can also use manufacturer's coupons to help further reduce those prices. This was a huge opportunity when the kids were in diapers. At the time (can't speak to current packages) there were three inner packs in the diaper boxes, which meant that we could use three manufacturer's coupons on each that we purchased - allowing us to typically save an additional $3 per box. The same held true for baby food and other things that we were buying. To us, it made the switch an easy one. BJs carries more than just bulk pack items and the things that we purchase at BJs has evolved, now that we don't need to pick up diapers anymore. They have a wide assortment of books, DVDs, CDs and toys for the kids. They offer sheets, towels and clothing, as well. In fact, the trench coat that I wear to work in the spring and fall, is one that I picked up at BJs a few years back. When my daughter was younger, we also were able to find a lot of dolly and me type pajama sets for her at BJs. They carry electronics - from telephones to TVs. They have kitchen accessories and party needs, paper goods and plastic ware. They have a nice selection of branded offerings, but also offer some products under their own label - in fact, we almost always purchase their brand of paper towels - we find it performs similar to the branded, but is a better value. for exclusive content visit Facebook or Twitter. greater convenience, offers the most payment options including EBT. If you’re not a club member, you can still shop and save. The wholesale club is offering a Free 60-Day Trial Membership, which can be activated until December 31. The risk-free, trial membership consists of full-member benefits and no surcharge. So, as you prepare for your holidays, consider a stop to BJs to help you wrap things up. No compensation was received for this post. All opinions expressed are my own or that of my family. A complimentary review copy was provided through Blogging for Books. I recently completed reading Christmas in Apple Ridge by Cindy Woodsmall. I don't know that realized it when I requested the opportunity to review this book, but it is actually a collection of three novels in one. I know that my children were impressed by the 566 pages and I was amazed at how quickly the book read. Christmas in Apple Ridge contains The Sound of Sleigh Bells, The Christmas Singing and The Dawn of Christmas. 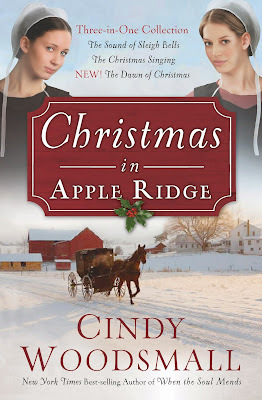 As you might surmise from title, all of the stories are set in Apple Ridge over a series of Christmases. This made me very happy, as each novella introduced us to new lead characters, the characters from the previous stories were part of the subsequent stories. I love that it gave me a chance as a reader to learn a little more about the lives of those characters that I had come to know as I read the other books. Cindy Woodsmall writes a character that you can't help but feel you know and who you can't help but cheer on, so there is something so satisfying about learning more about them, seeing them continue to develop and evolve. It somehow makes me feel more complete. In each of the stories, you get to meet and get to know an Amish woman and man, who both thought that finding love was not in their future. Yet, as they got to know each other, they discovered that there was someone that was rightfully suited for them and that love comes when you least expect it. I enjoy Amish fiction and this series of books did not disappoint. The Amish is part of who the characters are, but at the end of the day, their trials and tribulations are not that different than it is for all of us. These stories of love and determination are a great way to introduce yourself to the Amish fiction genre or continue your enjoyment of the category. It is so hard to believe that we are just over a week from Christmas. The time seems to be going so quick, and I'm no where near done with my Christmas baking. I know how I will be spending several evenings this week, makes me want to keep my menu simple - not necessarily making it quick, but low maintenance items, so that I can accomplish other things while dinner is being made. I learned something about my son this weekend, he doesn't like grilled cheese, but if you call it a Panini, he will eat it. Twice this weekend for lunch, he had a cheese and pepperoni panini. I always use a grill pan for panini, the first day, I used a panini press; the second day, I just pressed on it with my spatula. I guess I shouldn't be surprised that the difference is what you call it. When he was younger, he lost interest and would fight taking a nap...so, he recharged each day, in his room, with the lights down and the cd player playing his bedtime disc, and recharging frequently resulted in sleeping. I grew up watching Scooby-Doo and have shared Scooby-Doo with my kids. When I heard that Scooby-Doo Live! was coming to Akron, I was very excited, because I knew it was a show that the whole family would enjoy. Tickets for this show would make a great Christmas present. I love to take the kids to live theater and when they are already familiar with the characters, it makes it that much more enjoyable for everyone. Plus, we have a history of giving each other tickets to live shows and sporting events for Christmas. We have frequently made 'vouchers' for those events where the tickets haven't yet gone on sale or we didn't receive paper tickets. 2 Thrilling shows at 2pm and 5pm. 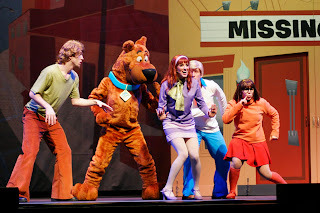 new characters, fantastic songs and outrageous antics, SCOOBY-DOO LIVE! 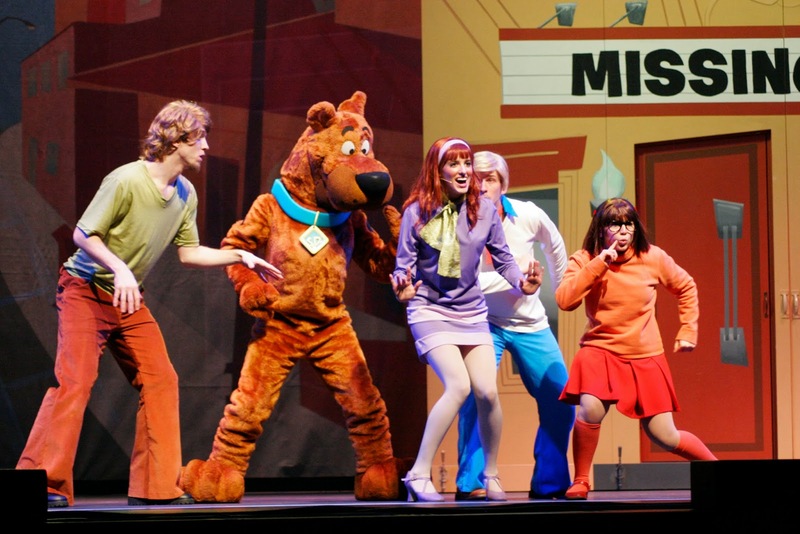 have audiences on the edge of their seats in traditional Scooby-Doo fashion. See if this time the gang is in over its head! I am excited to be able to share with my readers an exclusive password that will allow you to participate in the presale event, the day before tickets go on sale to the general public. Tickets go on sale to the public on 12/13/13 10am. No compensation was received for this post. The Akron Civic provided the information for the presale and the exclusive password to share with readers to participate in the presale. All opinions expressed are my own or that of my family. A Touching Story of Two Unlikely Friends. And How, Sometimes, Following God Can Lead You to the Most Unexpected Places. Until the day she sees Brandy Philip running across the college campus, easily outpacing security. Sabrina immediately recognizes world class potential, and it's all the more painful that it belongs to a troublemaking teen. When a chance encounter brings the two young women together, Sabrina realizes she's Brandy's best hope to salvage a life about to spiral out of control forever. I recently had the chance to read Chasing Hope by Kathryn Cushman. I was really drawn into the character of Sabrina Rice...after watching Chariots of Fire with her mom, she had set her dreams on being an Olympic runner and using that as a springboard to do mission work. As we get to know Sabrina, we learn that her dreams were crushed when she was diagnosed with Rheumatoid Arthritis and that she abandoned the entirety of dream, deciding instead to go into PR and put memories of running and thoughts of missionary work behind her. She left the school that she started and is now living with her grandma while attending a new school and working a job on campus, all while doing her best to maintain perfect grades. She is a busy young woman and very focused on school and the future. Brandy is the granddaughter of one of her grandma's friends. She brings her to dinner one night, hoping that Sabrina can help her out. Brandy's first impression of Sabrina leaves her not wanting to even give her a chance. Sabrina's Grandma convinces her to at least try to help her out, so she reluctantly does. As Brandy gets to know and trust Sabrina, she starts to see her in a new light. Working with Brandy, allows Sabrina to finally reflect on the impact that the RA has made on her life and to revisit what is important to her and what her true aspirations might be. With time, Sabrina and Brandy not only come to learn more about each other but also themselves and they start to develop a true friendship. Brandy realizes that Sabrina believes in her and uses that motivation to keep going - so as not to disappoint and in the process, achieves her own goals. Kathryn did a great job of weaving in Sabrina's prior reflections on the Children of Israel from her childhood when her dreams were still intact. As Sabrina begins to reflect on where she is now and how her life has changed and what direction is right for her future, she revisits her earlier writings and perspectives and these help her to reflect on what she once thought was her calling and whether her illness had taken it away or only changed it. I enjoyed reading through a couple of interviews with the author about the book. Through this, I came to learn that this story was in part based on her own daughter's experience of being diagnosed with a chronic illness at a young age. I also learned that she is not a runner, but did train for and run a 5K as part of her research. I really liked the idea that she was willing to do the research necessary to give the story a real perspective from what it took to train and run. She also reflected on the parallel that she was drawing with the Children of Israel and how just because something is God's calling doesn't mean it will be easy. 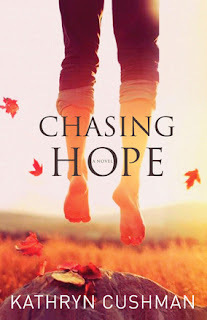 This was the first book that I have read by Kathryn Cushman, but after reading Chasing Hope, I would be interested in reading more of her books. She has one called Almost Amish, which with my enjoyment of Amish fiction, sounds like a great next book for me. If you are looking for a story of hope and friendship, I think this is a great book to consider. Have you read any of her books? What is your favorite? After three weeks of not really menu planning, I knew that I had to get back into gear this week. Of course, one of those weeks (10 days) was spent on vacation, so I had a good reason and really didn't flounder quite as much as it might sound I did. Plus, during that time, we found a new family favorite and enjoyed it twice in that window - Pizza Sticks (one night we had it on its own with salad and the other time we paired it with crustless pizza). This week things quiet down a bit from a scheduled activity perspective, but with the holidays fast approaching, it is good to have some time to be able to fit in all of those other things - like cookie baking (you can check out my 12 days of Christmas cookies series over on my A Busy Mom of Two in the Kitchen blog for inspiration if you are looking for ideas) and errand running. I finally made it to CVS on Wednesday to take advantage of their assortment of free after ECB items for Thanksgiving week. A couple of things struck me as unusual - the sale was before Thanksgiving, not on/after and the store seemed to be well stocked on everything. Sure, there were a few deals that they didn't include this year - like the headphones, but normally, even going first thing on Thanksgiving (when the sale started then), I would find a few things already stocked out. Of course, it being in stock didn't mean I remembered to get everything or that I had the right coupons with me - I should have taken the time to prepare my game plan and could have saved even more. I was not only getting deals, but restocking on the vitamins that I was in need of, so it wasn't a super low cost trip. Paid with $5 ECB and $7.83 plus tax OOP, earned $12.83 in ECBs. Paid with $12.83 in ECBs and $32.74 plus tax OOP. Earned $15 in ECBs. Paid with $5 ECB and $1.79 plus tax OOP. For everything, my net OOP was $42.36 plus tax and I have $10 ECBs to roll for about $80 in product at sale prices. So, I wound up getting it for about 1/2 off, I could have done better, if I had brought my coupons, organized my transactions and bought the third Alive (would have been a $12 ECB instead of $5). I did not make a trip back with their 30% coupon for Black Friday...I find that too much is considered on sale that it doesn't wind up saving me what it sounds like it should. Did you get any deals?